Excellent book! 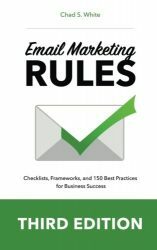 Everyone in the email marketing industry is talking about the book âEmail Marketing Rules,â by Chad White and I must join in the conversation! I use it daily as a reference guide and highly recommend you do too.